Comment: In Habakkuk and in Chains readers find injustice, lament, patience, and persistence. In her reflections on the text from Habakkuk, Donna Schaper asks, “How do we find the patience to wait—especially if we are being hurt?” (Feasting on the Word, Year C Volume 4, pp. 243-247) Schaper suggests keeping a point of focus and acting in small ways to keep hope alive help sustain patience even as one waits for justice to be done. Isabel sustains patience as she helps others in need. As she waits for justice, she finds comfort in the memories of her deceased parents, persistence in the desire to be reunited with her sister, and after many small acts of bravery, strength and courage within herself. On Christmas day, Isabel realizes even as her master may physically bind or harm her, her soul cannot be chained. She lives by her faith, listens to the voice within, finally setting herself free. Comment: Paul’s words are meant to be a helpful message to the church in Thessalonica as they live in the midst of suffering and persecution. Most children and adults will in some way be able to relate to the boost one receives in troubled times from encouraging words of support and love. Halinka’s experience in the girls’ home is difficult, but she finds comfort in the sayings and letters of Aunt Lou. “Unobtrusively I take Aunt Lou’s letter out of my undershirt and shove it under my pillow. Tomorrow I will put it back in my undershirt… I like to feel it when I walk around. Very much. It’s almost as if Aunt Lou is soothing me (Chapter 7).” As Paul’s words strengthen and encourage the church in Thessalonica, Aunt Lou’s words strengthen and encourage Halinka. Comment: This text serves as a reminder of the transformative power of love and kindness. Jesus’ desire to spend time with Zacchaeus changed him. Jesus teaches us how to live through his actions. Would we scoff at Zacchaeus the sinner, or join him for dinner? Our relationships are also transformed when we practice love and kindness. 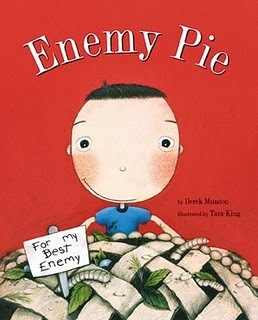 In Enemy Pie we are given a similar recipe for turning an enemy into a friend. A little boy’s father cooks up a pie to help his son get rid of his enemy, once and for all. Of course, there’s a catch—in order for the pie to work, the boy has to spend all day with his enemy and be nice to him. Do you have suggestions for others? Lectionary Links: Sunday, October 31, 2010 by Storypath is licensed under a Creative Commons Attribution-NonCommercial 4.0 International License.